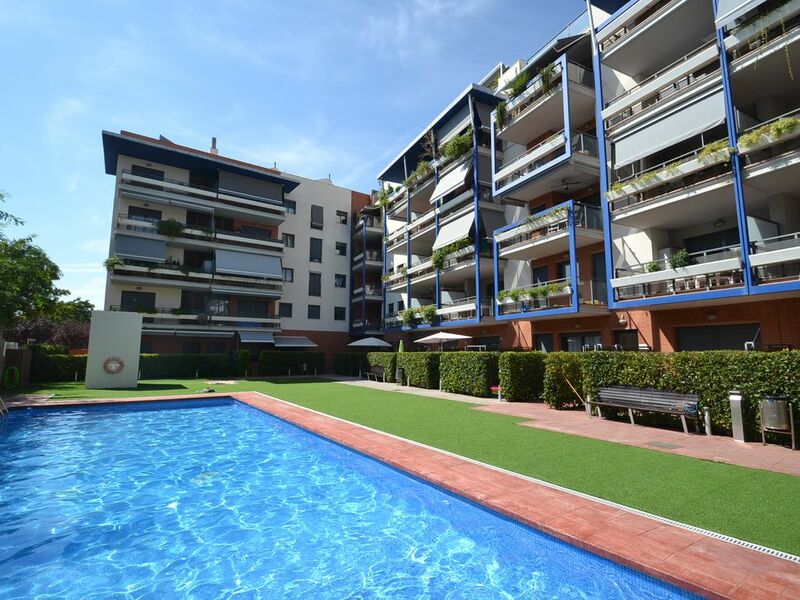 Air conditioned apartment situated in a family residence with community swimming pool located, close to Cambrils' beach and centre. This property, on the fourth floor (elevator), is bright and counts with two double bedrooms, a complete bathroom with bathtub, a modern and fully equipped independent kitchen (dishwasher, oven,..) and an American bar opening it up to the living room consisting of a dining area (table and chairs) and a relax place with double sofa bed and television with satellite to watch international channels. From the living room, there is a direct access, thanks to a wide picture window, to the main furnished terrace with a table and chairs, ideal for your meals. This is a spacious property with a spiral staircase to be found in the apartment's hall which allows to walk up to a private rooftop solarium terrace with swingchair, table, 6 chairs and sunshade. This additional outside space is intimate and offers panoramic views onto Cambrils, onto the surrounding mountains and the sea. Nice apartment, well kept and very comfortably equipped which includes the linen, the integrated air conditioning, the Wifi Internet connection, an Astra satellite TV with international channels, a private parking spot inside the residence as well as 3 bikes which are let at your disposal. It stands in a family residence, very well maintained, where you'll find a big outdoor swimming pool with lawn, a little gym room, picnic area and ping-pong table. It is located in a quiet and family residential area, close to the beautiful sand beaches Horta de Santa Maria, la Riera and la Llosa along a maritime promenade with cycling track, very well fitted out (playground, green zones, little restaurants,...). Cambrils maritime promenade extends several kilometers, giving opportunity to have long walking till Cambrils Mediterraneo (on south) or to reach Salou. A few minutes walking stands the centre of the seaside resort where you'll find all kinds of facilities (restaurants, shops, supermarkets, chill-out bars, ice-cream makers, etc... ). Close too from Cambrils' little fishing port and from to the Wednesdays market, to the train station and to a wooded park which is ideal for children, there is a supermarket just in front of the residence so that you can easily go for shopping and a rotisserie. This is a very complete and ideal property which grants you with quality family holidays by the beach. Catalonia applies a holiday tax included in the tariff. Cambrils is one of Costa Dorada's seaside resorts, in Catalonia, with a beautiful fishing and sailing port, standing about 100 kms South from Barcelona, 10 kms from Tarragona and 5 kms from Salou and its famous Port Aventura theme park. Cambrils is a perfect destination for family holidays and, moreover, the resort has recently been labelled as Family Tourism Destination by the administration of Catalonia. You'll find there large fine golden sand beaches, lined with beautiful maritime promenades with children playgrounds, beach huts and parks. Cambrils has decided to put the emphasis on play-based, cultural and sports activities with many entertainment activities and animations available throughout the summer, sports facilities with the possibility to go sailing, practice paddle or for example snorkel. This also is a seaside resort which is famous for its shopping streets and good tapas restaurants by the port. Very well situation of the apartment in a quiet area but close to the centre of Cambrils, ti the port to the sand beaches and to the large maritime promenade pedestrian and for bikes in Cambrils . To make a long story short, this apartment gathers all conditions for you to have a great stay in Cambrils with your family. Included equipment: Wifi connection, satellite, integrated air conditioning, private subterranean park spot, linen (sheets and shower towels), 3 bikes. Well maintained swimming pool and garden Big private and intimate solarium . Little supermarket and rotisserie less than 100 m. Well kept rental with modern furniture and decorating, bright bedrooms and kitchen Quiet area and close walking to all the activities and the beach Last floor with terrace and private solarium. Furnished terrace and private solarium with swing chair , table, big sunshade, chairs and deckchairs on the roof. Access by spiral stairs inside the apartment. Free extra in the residence: sports hall, ping pong, comunity swimming-pool. superbe location. A 2 minutes à pied du centre-ville et de la plage. Propriétaire très accueillant. Appartement parfait. location très complète. J'y retournerai sans aucune hésitation et je la conseille vivement. Propriétaire vraiment très sympathique. Très chouette et agréable appartement, pratique, bien agencé, bien disposé, facile d'entretien. Propriétaire très accueillant. Bel appartement, tout à porté de main (cuisine, living, terrasse, sdb...) Beau solarium, belle vue, et pratique pour secher du linge. Belle piscine propre et jardin agréable. Immeuble calme et bien tenu. Cuisine ouverte, beau grand frigo, lave-vaiselle, et machine à laver (bien venu en vacances). Bonne literie sur le lit double. Airco fonctionnait très bien sans faire trop de bruit. Juste dommage le jacouzzi en panne à ce moment là. Toute l'equipe de World Vacances Plus ainsi que le propriétaire, vous remercions pour votre message. Nous sommes ravis que vous ayiez passé un agréable séjour et restons à votre disposition pour vos prochaines vacances sur la Costa Dorada. Le propriétaire est très accueillant. L appartement est situé près de toutes les commodités (commerces, plages et gare à pied). L immeuble est calme et à de nombreuses prestations (piscine, salle de sport, etc). Nous avons passé de très bonnes vacances et reviendrons certainement. L'équipe de World Vacances Plus reste à votre disposition pour vos prochaines vacances en Espagne sur la Costa Dorada. "appartement bien équipé,propre,piscine agréable,endroit très calme, malgré la présence proche de voie ferrée. Nous avons passé de bonne vacances, propriétaire sympa dommage que la barrière de la langue complique la conversation !" "Appartement très bien équipé, très propre. Propriétaires très gentils et accueillants. Cambrils est une très jolie petite ville avec un port très agréable. La plage (immense et très propre) avec douche et toilette est à 5 minutes à pieds par un chemin ombragé. Le centre et le port sont également à 5 minutes à pieds. Supermarché à proximité (possibilité à pieds également si on n'est pas trop chargé). Nous avons gardé les références pour y retourner." Cambrils is a very charming family seaside resort, to be found 100 kms South from Barcelona, 10 kms from Tarragona and 5 kms from Salou and its famous Port Aventura theme park. It has been known for long by tourists from all over the world due to the quality of its beaches, perfectly fitted out, its little port, gastronomy, and its long maritime promenade allowing to get to Salou, going along the beach. At mid-way between Cambrils and Salou, you'll find the family tourist area of Vilafortuny with its little shops facing the beach and, in direction to Miami Playa, the residential areas of La Llosa, Mediterraneo and Tarraco.